Nature's Sunshine •Helps the body support a healthy prostate gland. •Provides nutrition for the male glandular system. Helps the body support a healthy prostate gland. Provides nutrition for the male glandular system. 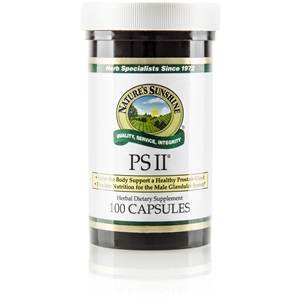 PS II supplies varying amounts of macro and trace minerals—nutrition needed to nourish the male glandular system and support a healthy prostate gland. Pumpkin seeds, saw palmetto fruit, licorice root, black cohosh root, gotu kola aerial parts, capsicum fruit, golden seal root and rhizome, ginger rhizome, dong quai root, lobelia aerial parts, and kelp leaves and stem.